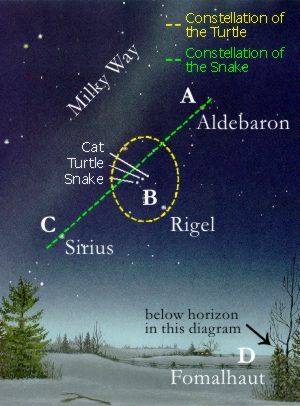 The Snake is generally associated with the Eliptic path of planets, and sometimes with the Milky Way (seen above and to the left of Orion.) The green dotted line may also be used for a narrative sequence rather than as an animal spirit symbol. The letters A, B, C, and D correspond to Eddy’s sight-line markers. Original background star graphic derived from “Exploring the Night Sky” by Terence Dickson, published by Equinox Magazine.